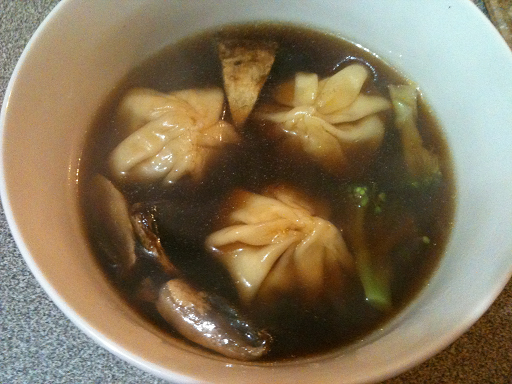 I found this Pork Wonton Soup recipe in that wonderful Woolworths Fresh magazine. It is very simple and easy to make and very delicious. I didn't have any bok choy which the original recipe calls for so used broccoli and mushrooms instead. The wonton wrappers were purchased from a Korean supermarket which was a few blocks away from where I work so easy to get. I couldn't find them in my local supermarket. 1. Combine mince, chestnuts, shallots and oyster sauce in a bowl. Season with salt and pepper. 2. Mix cornflour with 1 tbsp cold water to make a smooth paste. 3. Place three gow gee wonton wrappers on the bench top. 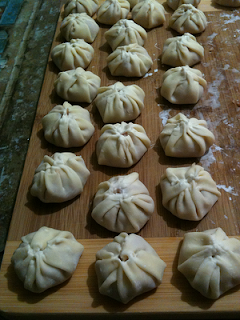 Put a teaspoon of pork mixture into the centre of each wrapper, brush edges with cornflour mixture then bring up corners to form a sack and repeat (as above). 4. Pour stock and water into a large deep saucepan and bring to the boil over high heat. Add soy sauce, sesame oil and wontons. 5. Cook for 3 then add broccoli and mushrooms and cook for another 3 minutes. 6. Ladle soup into bowls and serve.